While this may seem a bit persnickety, the rewards are great. 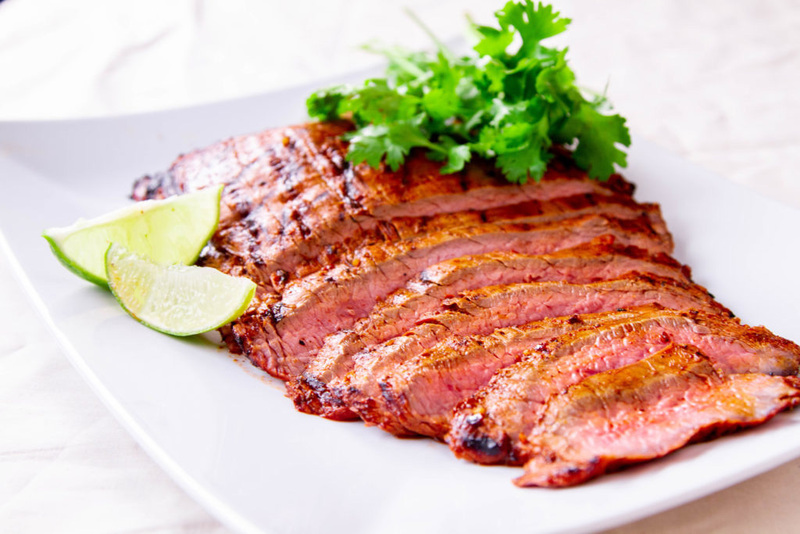 One flank steak yields positively stacks of thin, juicy strips of beef that can be piled on sandwiches, a hearty salad, tacos, or just piled on a plate next to some roasted potatoes. I have repeatedly mentioned cooking this cut to medium-rare, and I mean it. If you like your steak medium-well, I recommend a different cut, because this thing will be tough at that temperature. For a rare flank steak your target temperature (Check it with a Thermapen Mk4) is 120–130°F (49–54°C). For a dark-rosy medium-rare, shoot for a final temperature of 130–135°F (54–57°C). You’ll get about 5–7°F (3–4°C) of carryover cooking on a flank steak after you remove it from the grill, so plan your pull temp accordingly. Adapted from Chipotle Flank Steak with Blue Smoked Slaw, on The Sauce. The whole recipe looks delicious and we recommend trying the smoked slaw, but wanted to focus on the protein here. Trim your flank steak of any silver skin or excess fat. There is a membrane that runs through much of the center of the steak that you should leave be. Chasing it will destroy your steak. Marinate/brine the flank steak in the refrigerator for at least1 hour/pound of meat. This will help to soften the tough fibers before cooking by dissolving some of the proteins that will otherwise coil up and toughen. Remove the steak from the marinade/brine and shake of excess. 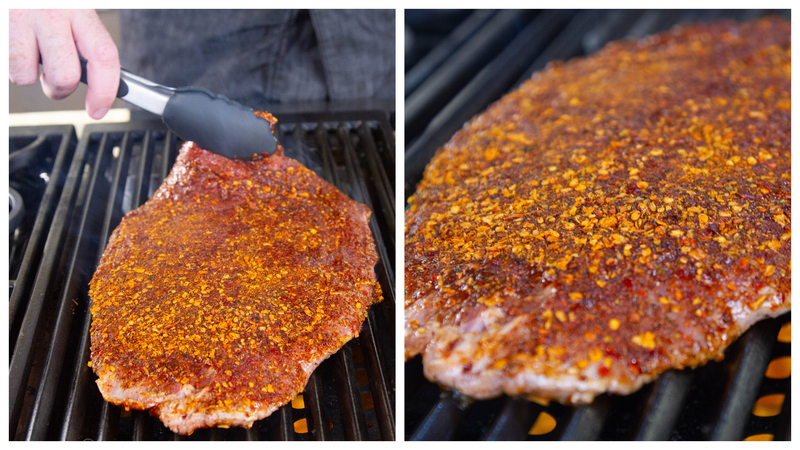 Coat the flank steak generously on both sides with chipotle rub. Let the rub “soak” for a few minutes to adhere to the meat better. Oil the grill grates well. When the first side is well seared, flip the steak. Cook on the second side, checking the temperature every few minutes with your Thermapen Mk4. When the internal temperature reaches 125°F (52°C), pull it from heat and allow it to rest for 5 minutes. Slice the steak very thinly across the grain and serve in any of a thousand ways. Serving a small crowd with beef is never easier than it is with a flank steak. Whether it’s fresh off the grill or cold on a buffet, flank delivers meaty goodness with ease. 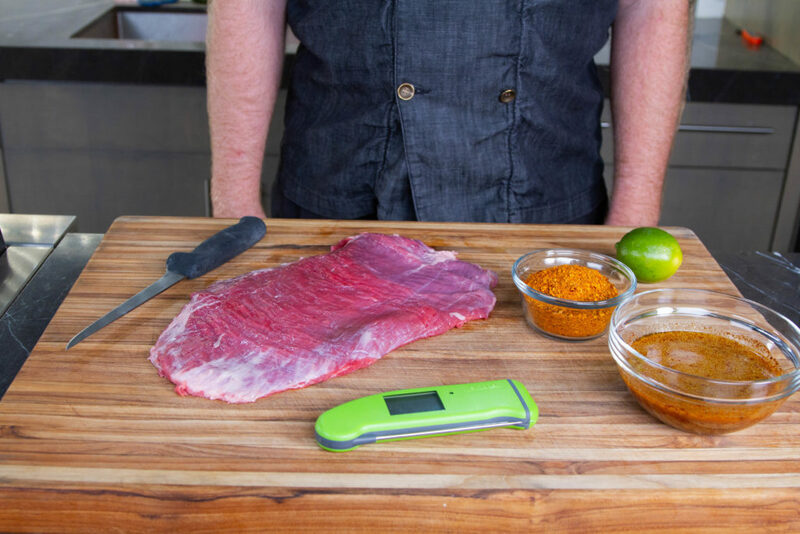 And cooking it right with a Thermapen Mk4 ensures juiciness and tenderness every time. I missed the brine recipe somewhere. I’m assuming it’s salt and water. Chipotle rub- do I make it. Is there a recipe? Good question. The recipe from ATBBQ calls for a particular brand of pre-made brine mix that has chipotle in it. I didn’t want people to think they had to get that one brand, so I left it as “any brine or marinade.” We really just wanted to focus on the thermal aspects of cooking the steak itself. The thing about flank steak is that you can flavor it any way you want, but it’ll only be good if you cook it correctly. I hope that helps clear up the confusion! Good article! We love flank steaks here, so I grill them often. I use Smoke with a probe to pull at 135 degrees with a 5 min sit. This yields pink with subtle hints of red – a tiny bit more done than in the pics above. The main difference is that I sear-n-roast flank steaks with a 2 zone process. 2.5 minutes per side over maximum heat to put some grill marks on the meat, and then indirect heat and wait for the probe to beep at 135. Comes out perfect every time, and the results are better than a straight-up sear.